Soaking 101 - When to Soak your Laundry and for How Long? Soaking or Spot Cleaning - Is anyone else always faced with this dilemma? I don’t know about you, but with two little children I seem to be always faced with stains on clothes and wondering when I should soak them and when I should just give them a quick spray and then put them in the wash. After speaking with the team at Tri Nature HQ, I was given a little insight into our Top Tips for Soaking! . . .
At Tri Nature, we suggest that for effective stain removal, both general and heavily stained fabrics should ALWAYS be treated prior to washing and we split this into 3 categories. 1. For light staining, simply use our Alpha Plus Laundry Powder in the wash. No pre-rinsing required - This product has won awards for good reason! 2. For medium to heavy staining, discolourations and brightening whites you can treat the fabric with our Alpha Plus Pre Soak Powder. Simply add 1x 25g scoop to a bucket and commence soaking. For best results leave soaking for a minimum of 60 minutes. Then pop in the washing machine with our Alpha Plus Laundry Powder. No rinsing prior to putting in the machine required! Should you use hot or cold water to soak? For stains of blood, fruit, dirt, coffee, soak in cold water and for grease and oil-based stains soak in hot water. Simple! 3. For super heavy staining (those stains that seem impossible), we recommend using our Enhance Pre Wash Spray. Simply spray onto the affected area and leave sit for two minutes. Next, follow the second step above. You won't believe the results you get from plant based products! Since gaining this insight on how to use the products properly (and understanding when to use hot or cold water), I have never looked back and my family’s clothes are now cleaner and brighter than ever! Not only are these products environmentally friendly and safe for my family and pets, they also produce REMARKABLE results! A bonus is they are also grey water and septic safe! 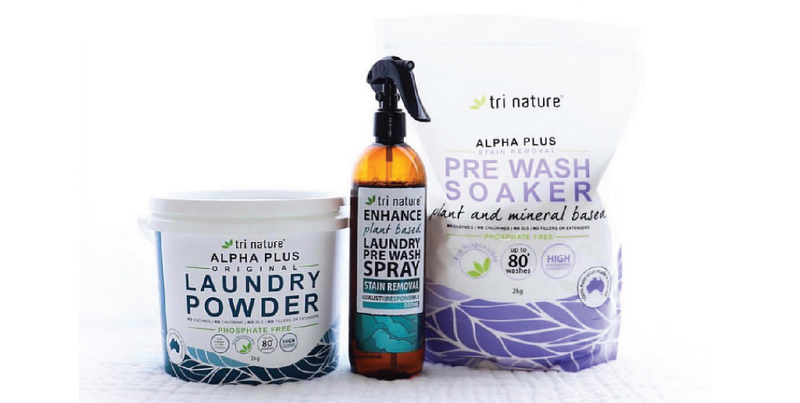 I now wash all our clothes in the Tri Nature Alpha Plus Laundry Powder - my favourite is the Ocean Fresh as I absolutely love the fragrance! If you've never tried our products before, a great place to start is our Green Laundry Starter Set. So next time you’re wondering what to do, follow our Top Tips for Soaking and let the results of these green cleaning products speak for themselves! Want Remarkable Results with Eco Friendly Products? Watch this video where Leah talks all things Laundry Soaking. Aka: Mum to 3 children (1 being a husband), German Sheppard Lover, Home Builder & Interior Design Enthusiast, Mother to a 5 year old environmentalist.